IF YOUR ORGANIZATION NEEDS MONEY, WE CAN HELP! New Earth products will help any lawn or garden grow lush and beautiful. If your nonprofit is looking for a great way to raise extra money, there is no better way then to help your community create fresh, healthy landscape. The New Earth Fundraiser program is designed to assist non-profit, 501(c)(3) organizations raise funds and better serve their mission. 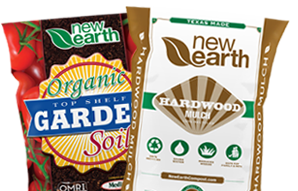 New Earth provides select bagged products at a discount to your team to sell in your communities and networks. Our team of professionals will be happy to provide you and your organization with guidance and tips to help you raise the most funds possible.